Gaude Gloriosa; Miserere nostri; Loquenbantur varis linguis; If ye love me; Hear the voice and prayer; A new commandment; O Lord, give thy holy spirit; Purge me, O Lord; Verily I say unto you; Remember not, O Lord; Tunes from Archbishop Parker�s Psalter; O Lord, in thee is all my trust; Christ rising again; Blessed are those that be undefiled. These are some of the first Tallis recordings. They were made in the early 1980s by Peter Phillips� ground- breaking �Tallis Scholars� and originally issued on LP. It is more than good to have them at last gathered together in this beautiful presentation double CD format and slip case. The style and language of the works are mixed up between the two CDs so that each offers a varied programme counter-pointing material from throughout Tallis�s long and fruitful career in music. It is music that one admires increasingly as the years go on. Since the 1980s Tallis has been recorded regularly. There is now considerably more competition for the Scholars than was the case when the LPs were first issued. At the time only Andrew Parrot�s two EMI discs were serious contenders. Of these recordings it was said at the time that one of, perhaps the only one of, Peter Phillips� problems was his tendency to drive the music too relentlessly, to set an unvaried tactus and to stick with it come what may. This is more true of some of the later recordings; for example the John Shepherd and the William Cornysh discs. Curiously, I also feel it is true when the ladies are singing in the stratospherically high large-scale motets. By contrast the pieces in English for men�s voices alone flow at an idyllically steady and ideal tempo. There is though an element of the hurried trait in these early recordings, for example in the �Sancte Deus� which quite rightly moves on in its middle section. This pacing could surely have relented in the final gloriously flowering �A-men�. This performance is also spoilt by having too strong a top part and by rather muddy lower voices. This is also a criticism I would level at the recording of �Salve intemerata� on CD2. The recent CDs by Alistair Dixon and Chapelle du Roi, issued as part of their ongoing complete Tallis series for �Signum�, avoid both these criticisms. Dixon�s speeds can be leisurely but they are also poised. His �Sancte Deus� is a good example at well over half a minute slower. Even the short simpler English anthems like �If ye love me� come as even more relaxed and spiritual in Dixon�s versions. When listening to the �Tallis Scholars� you are not hearing the music as Tallis heard it. That is also true of Alistair Dixon�s versions also with women�s voices on the top part. The latter however use only a handful of sopranos whereas Phillips goes in for the bright rich sound of several strong female voices. The famous setting of �The Lamentations� comes over very well with the Tallis Scholars. They opt, because they have women on the top part, for the higher key favoured by Edmund Fellows in his now quite ancient edition. That said, we are told that Sally Dunkley prepared the present edition of this work and David Skinner and John Milsom have �papered� the others. �The Lamentations� has the key signature of three sharps, giving a modern day key of A major/F#minor. This also gives a high tenor part and a wonderfully rich high bass - much enjoyed by these singers. The performance gradually evolves towards its glorious dénouement and does so quite naturally and very movingly. In his accompanying essay Peter Phillips writes of the four periods in Tallis�s lengthy composing career and how they equate to the historical events which surrounded him. They can be seen as: (1) the Henrican works, the pieces written mostly before 1545, in some cases apprentice pieces like the rather dull �Magnificat for 4 voices� and �Ave, Dei patris filia� which shows the influence of the Eton Choirbook and composers like Fayrfax and Taverner. (2) next came the severe Protestantism of Edward VI�s reign. Tallis, as Peter Phillips, remarks did not sulk but got on with life writing some of his most beautiful and memorable anthems like �Hear the Voice and prayer� and �A new Commandment�. (3) then came the final flowering, the years of Elizabeth I, when, alongside William Byrd, the two composers were free to explore almost any style sometimes choosing Latin but infusing it with a clarity and directness lacking in the earlier Latin works. Now often performed pieces like �In manus tuas� and the expressive �O sacrum convivium� represent this late flowering. To sum up. 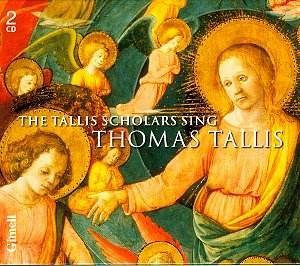 If you do not own the Scholars� Tallis discs then you simply must have these. You should also investigate the Signum discs mentioned above, and indeed the Hilliard Ensemble�s recordings. Listening to the Scholars now sends me nostalgically into a late 1980s time-warp, of Oxford colleges where they were first heard and dark winter Cathedral concerts, of hard seats and glorious music resounding in the lofty clerestory. This was a way which was new to most of us, exciting and stimulating. All of these emotions are re-captured on these timely re-issues. Full texts are given and Peter Phillips� thoughtful essay is translated into French and German.